[RIP] welcomes you to join and get stuck in! Any Issues, problems or suggestions let us know! Due to some slight hardware problems, we have a new 72 slot server up and with testing tonight, all is running smooth. Seeing the teamwork shining through to good effect, its a pleasure to play this game with like minded peeps! Our server has moved to a new IP with DDOS protection, hopefully all our comms problems has been solved. Server is perfroming awesome and is always full. i forget, do you guys take yanks too? Server is updated and is official Squad Server now! Nice server, good teamplayers and squadleaders! Server has been steady since we put better firewall 2 months ago. Some of us are still playing PR. Good server, no lag, no downtime... just good games. 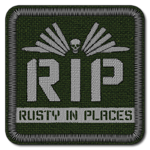 RIP are a fun clan to play with too, welcoming to new players and happy to have you in squad with them.